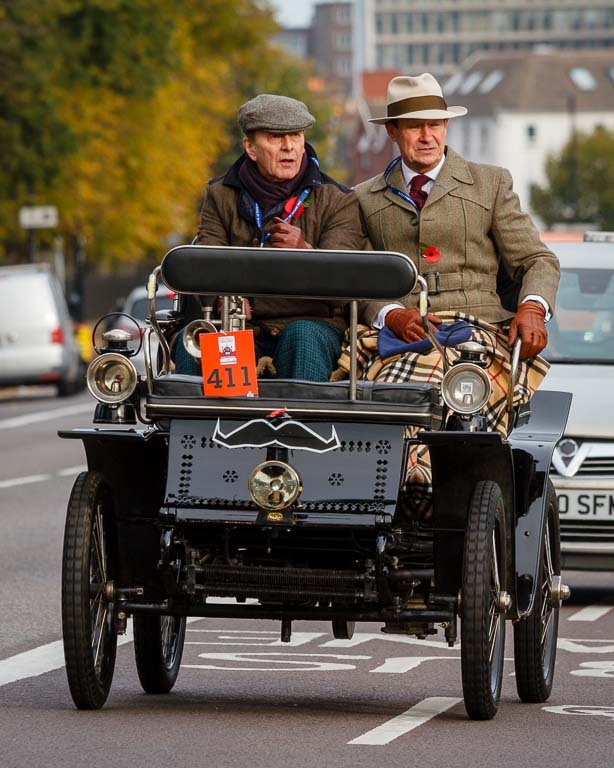 Enjoying the drive during the 2018 London to Brighton Veteran Car Run. 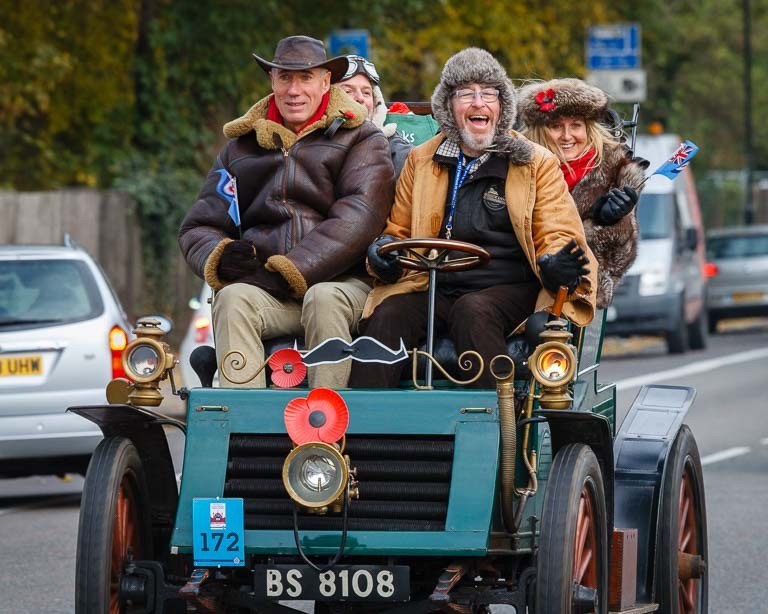 The first Sunday in November always brings the renowned London to Brighton Veteran Car Run. 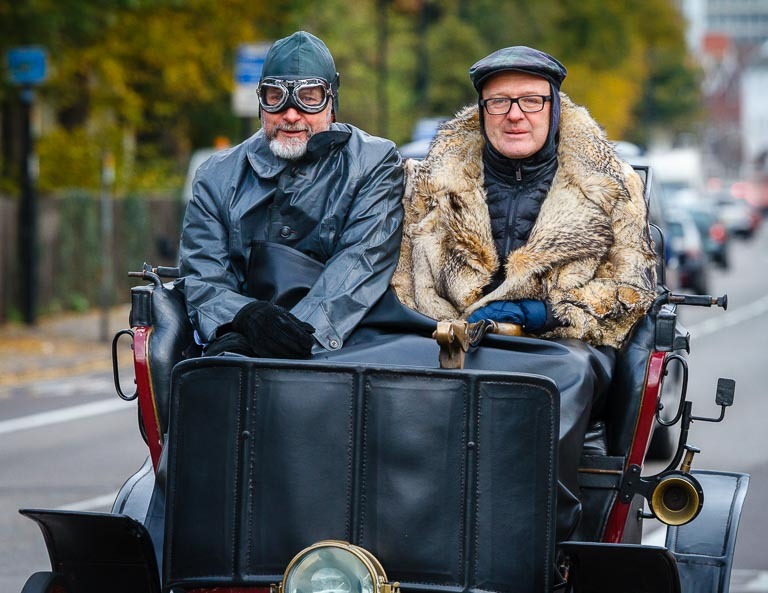 It is the world’s oldest motoring event which has run continuously. 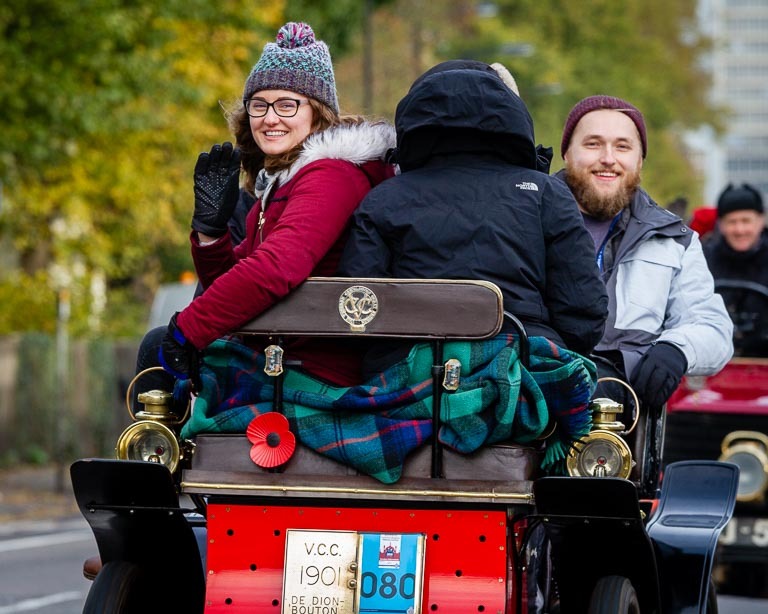 A widely held belief is that the event celebrates the abolition of the legal requirement for someone with a red flag to walk in front of a motorised vehicle. In fact, the run marks the day when the maximum permitted speed rose from 4 to 12 mph. The need for a man with the flag having been abolished some years earlier in 1878. Nevertheless, the start of the 1896 run did see the symbolic burning of a red flag. November is not an ideal time of the year to drive over 50 miles in vintage cars. Many are open to the elements and they break down. A lot. Making repairs with cold hands, especially if it is raining, cannot be much fun. If only the parliamentarians of yore had had the good sense to pass their reforming Act during the summer. 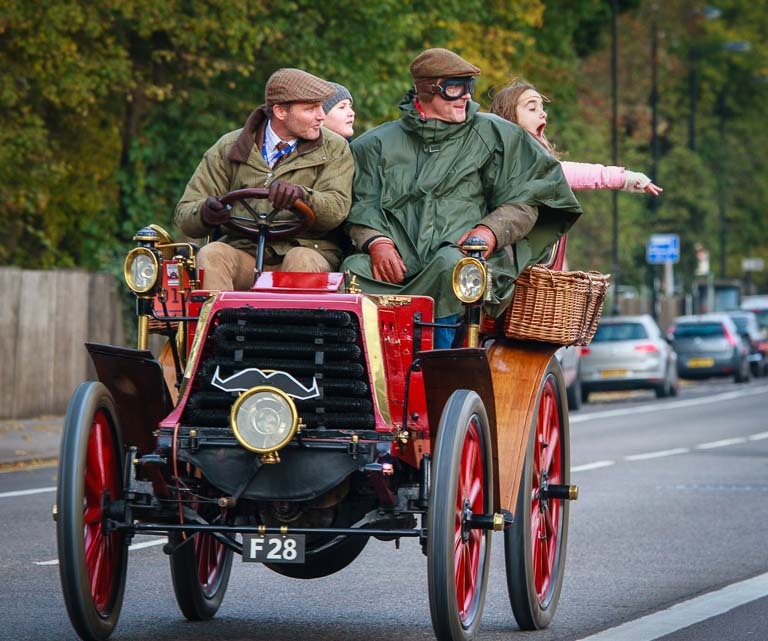 Only cars manufactured before 1905 are eligible to participate. 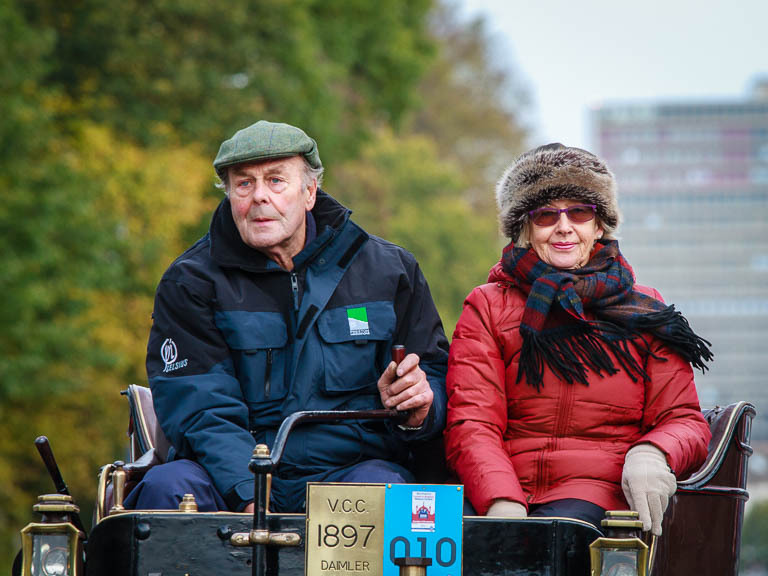 It makes for an unusual spectacle, seeing the old timers taking to the road. It helps that the organisers encourage participants to wear period attire, although many don’t. The route passes close to my home and I try to photograph the event whenever possible. It is worth mentioning the equipment I used, as I suspect it had a bearing on the results I obtained. The camera was my Canon 7D Mk 1, set to wide area continuous autofocus. It was actually the lens, though, which probably made the difference. Being a white Canon 70-200 f/4 , it seems to have attracted the attention of many of the participants. Maybe I looked professional and stood out from the other people around. In many of the shots, there is a strong engagement as the drivers and their pasengers are looking directly at the camera. Photography was not always easy. The local authority has decreed that no lamppost, and there are quite a few of them, is complete without at least one sign. They are meant to be seen, of course, hence are not discrete. Coupled with that, someone had parked a white van in the bus lane opposite and I needed to avoid that as well. Eventually I settled on shooting the lens more or less at its maximum focal length and the aperture set to f/5.6. I found that if knelt on one knee, it was easier to control what appeared in the background. I still found myself having to remove quite a few of those wretched signs during post processing, though. What follows is my record of the day. I was less interested in the cars and concentrated more on the participants. I wanted to depict them having fun on their grand day out. It took a while for car design to adopt the now accepted seating arrangement where everyone faces forward. It means that driver ends up sitting behind the passengers who cannot easily see where they are going. Some well known people participate. 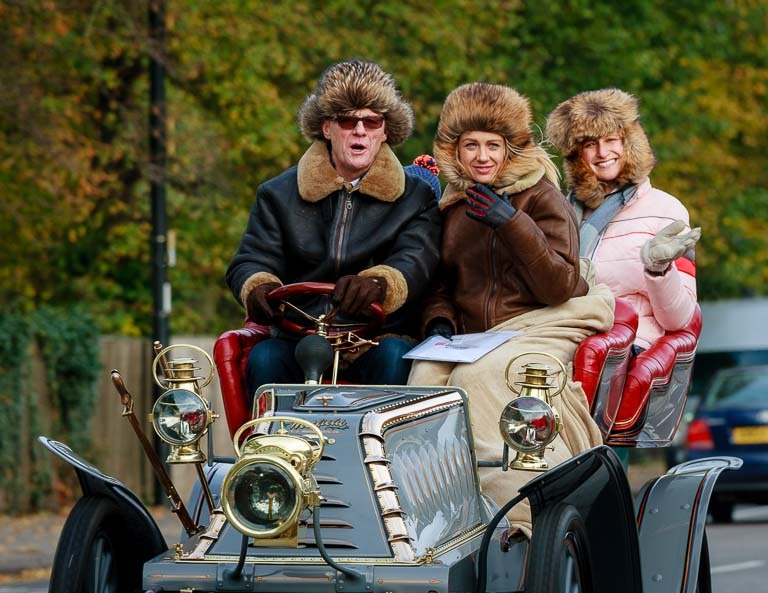 This is John Caudwell, the entrepreneur who made his fortune by founding Phones4U, and his family. There was a petrol station close to where I was standing and a lot of cars pulled in. These people must have seen someone they recognised. Maybe it was these participants who were topping up the radiator with water. Old cars and modern petrol stations are just one of the wonderfully incongruous sites of the day. Who is driving? Some older cars have tillers instead of steering wheels. The driver is on the right. 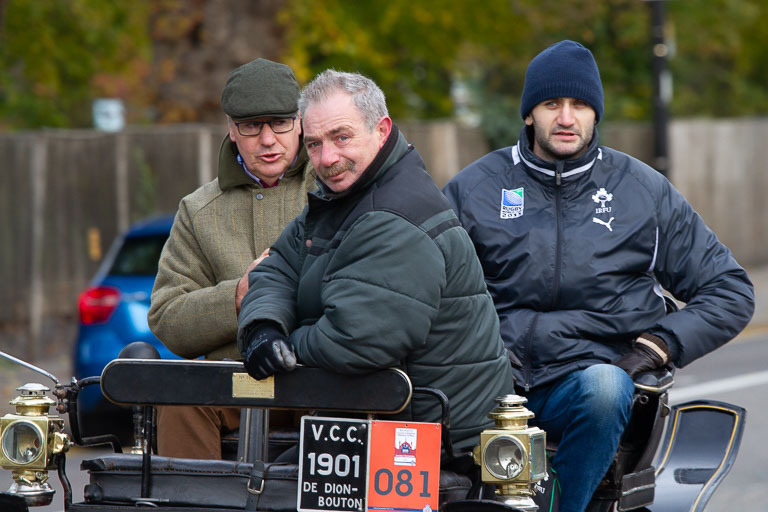 One of the oldest vehicles in the run. A Daimler from the time before the manufacturer met Benz. Another car which predates the invention of the steering wheel. 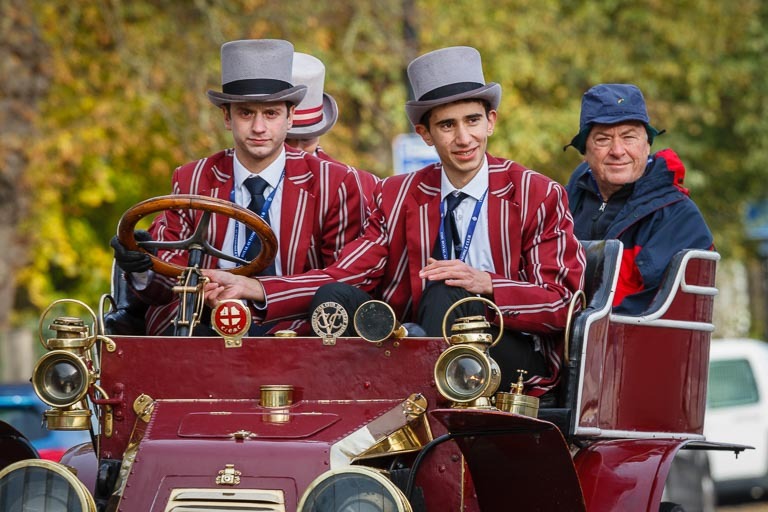 Harrow School has its own veteran car and every year some of its pupils have the good fortune to drive it in the run. 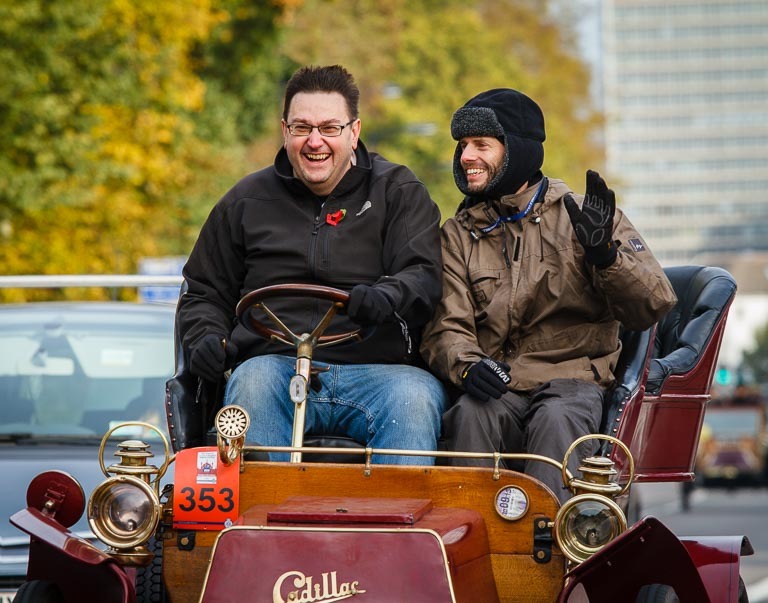 This is one of the few shots which I took during the veteran car run which depicts a whole car. Joie de vivre. Two participants having fun. 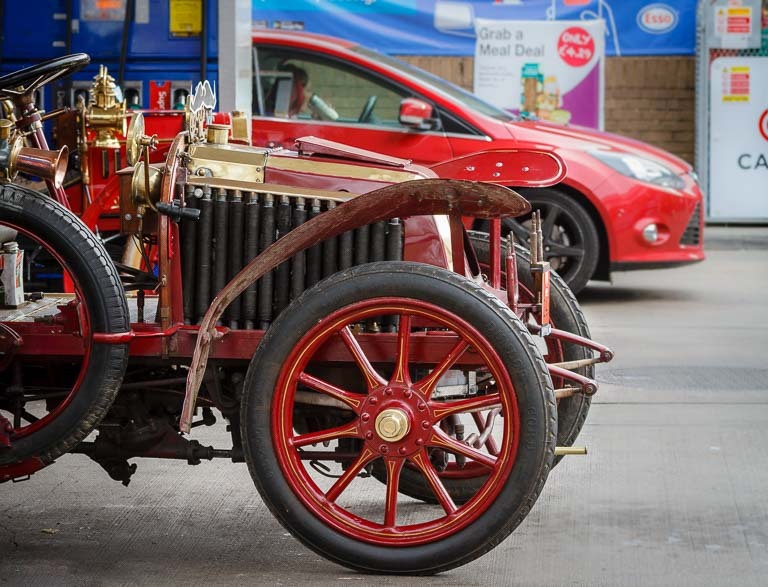 Old and new, side by side at the petrol station. The technology might have improved, but they both run on the same fuel. My images of this race in 2017 were in a similar setting. However I concentrated more on the cars than the participants. I believe your pictures of people in the cars make for better images which I shall bear in mind when I next cover this event. I recall quite a number of cars broke down whilst I was there one cold early morning,from that point of view nothing appears to have changed. You managed to obtain some good shots though,alas little can be done regarding Croydons lampposts or distracting modern vehicles. Thanks for your comments, Michael. 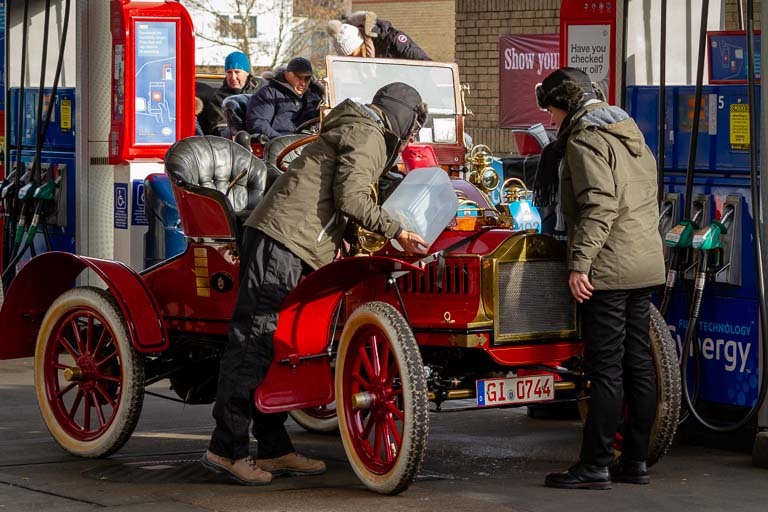 Only cars manufactured before 1905 are eleigible to participate, so breakdowns are inevitable. 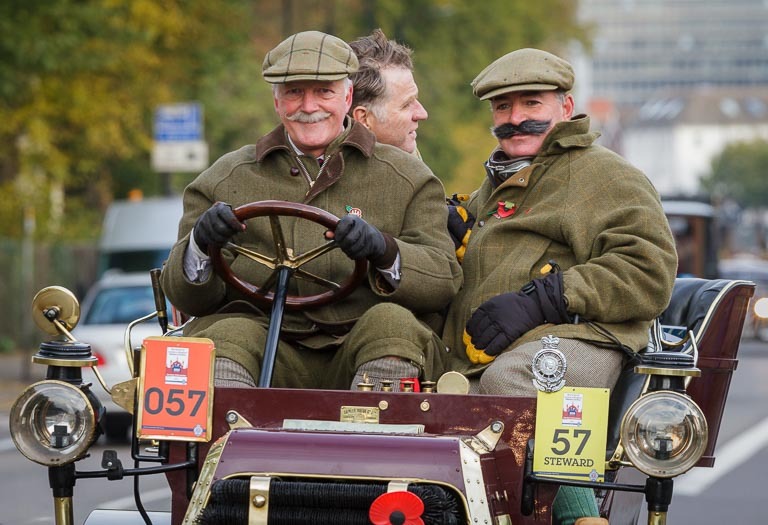 They are all well over 100 years old and the 60 odd miles to Brighton represents a real challenge. It is astonishing that so many do make it, a testament to the dedication of their owners to keep them roadworthy. The beginning of November does not usually offer good weather conditions and it often rains. Most of these cars are open to the elemnents and I know from my own experience that it gets very cold, rain or shine. While I like seeing the cars, for me they are only part of the story, which is as much about the participants enjoying their day out. Long may it continue.